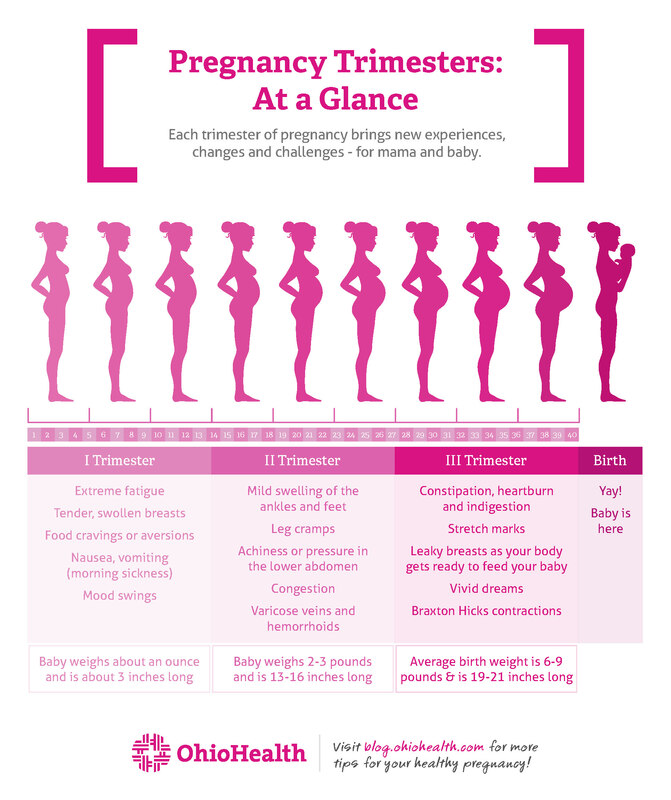 Discover the changes each trimester brings, from the time sperms-meets-egg to when mom-meets-baby! A typical full-term pregnancy lasts 40 weeks. Pregnancy is grouped into three stages called trimesters. You and your baby go through big changes during each 12- to 13-week trimester. Remember, every pregnancy is different. You may or may not experience some or all of the typical symptoms that come with hormone changes and a growing baby. During the first trimester, not having your period is the first sign of pregnancy you’ll likely notice during your first trimester. Thanks to surging hormones, changes kick in during this stage that affects nearly every organ of your body. During the first trimester, your baby grows from a single fertilized cell to a moving baby with growing limbs and developing organs. How can you accommodate changes during the first trimester? This is the time to make a habit of taking good care of yourself. Your good health helps your baby as he or she continues to grow. You may need to get to bed earlier to fight fatigue. Eating smaller, more frequent meals can help with nausea. Usually, during the second trimester, you and your body have happily adjusted to the hormone changes that come with pregnancy. Morning sickness eases up, or even disappears. You sleep better and have more energy. You’ll feel your baby’s first fluttering movements. If you haven’t shared the news of a baby on the way, a baby bump will do it for you toward the end of this stage. With major organs and systems in place, the second trimester kicks off your baby’s growth spurt. As he grows, he’ll kick, roll and move his growing arms and legs. How can you accommodate changes during the second trimester? Keep treating yourself and your baby to the healthiest diet possible. To help reduce swelling, keep active. Put your feet up when you’re not moving, and avoid long periods of standing on your feet. This is the final stretch of your pregnancy, in more ways than one. Changes and symptoms you experienced during this stage likely continue and increase. Space in your abdomen gets tight. Your uterus gets bigger, pushing your stomach up, giving your lungs less room to expand and putting pressure on your bladder. Fatigue returns as it gets harder to find a comfortable position to sleep. But as the countdown to your baby’s birth moves from weeks to days, any discomforts will soon be just memories! Your baby’s growth is on a fast track during the last weeks of pregnancy. Organs like the lungs and kidneys finish maturing, and the brain continues to develop. How can you accommodate changes during the third trimester? If you aren’t practicing Kegel exercises to strengthen your pelvic floor, now’s the time to start. Cutting back on drinking liquids close to bedtime helps cut down on trips to the bathroom at night. Sleeping on your left side is best for circulation — yours and your baby’s. Pillows between your legs, in front or behind you, can help give you support and make you more comfortable. Ready to learn more? Check out our maternity classes at OhioHealth!